1. Start your foot search immediately! As soon as you discover your pet is missing, take steps to recover it. Do not just wait for the animal to find its way home. We cannot emphasize too strongly that time is critical. However, never give up hope.. never give up going door to door. We have helped reunite cats with their family after 9+ weeks. There are many stories of reunification after years. They are scared and waiting for you to find them. General search tips – Dog gone it, you lost your pet as well as specific tips on how to create and post flyers. 2. Visit the Beaufort County Animal Shelter every 1-2 days. Please bring a photo of your pet. You are the only one who can positively identify your pet. Leave your name, address, a daytime phone number, and a description of your pet. Inform them if your lost friend has a microchip. 3. 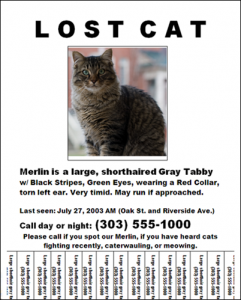 Create a Missing Pet Flyer. Consider offering a reward to the public. Be sure to include the date and the area where your animal was lost or found. Go door to door in your neighborhood dropping off flyers. Post signs in nearby convenience stores, grocery stores, and Veterinarian’s offices, not on utility poles. If a picture is included on the sign, it is easier for someone to identify your pet. 4. Check with your mail carrier, garbage collector, and other individuals who regularly frequent your neighborhood as well as local vets and the Urban Search and Rescue team. This is a lost pet alert from your neighbor Brian. He lost his dog Cody on July 5th. Cody is a brown and black German Shepherd. If you have seen him or can help, please call 859-555-5555. You can also view your neighbor’s lost pet and their contact info at TotoAlert.org. Please note: There is a fee for this service. 6. Missing Pet Partnership is a national, nonprofit organization dedicated to reuniting lost companion animals with their owners/guardians. The website offers behavior-based lost pet recovery tips and referrals to lost pet services. 7. Try using facebook. There is a story of dog that went missing Beaufort while on a trip from Georgia and was found via Facebook. 8. mobiPET is the only mobile photo amber alert program for pets – bringing the power of mobile networking to your search for a lost pet. There may be a fee for this service depending on the level. 9. Prevention… Micro-chip your pet now before he/she goes missing. Be proactive…With one in three pets getting lost in their lifetime, ensure that your pet (dogs AND cats) is microchipped. There is a greater chance of a happy reunion if your lost pet is microchipped. Microchipping is available through HAL or the Beaufort County Animal Shelter for a small fee. Found dog tips – from Dogs of America. Know what to do if you find a homeless dog. Many of these tips also apply to cats. HAL Facebook page is full of missing pet pictures and pleas. The Beaufort County Animal Shelter “should” have a complete list of lost and found pets.